Sagarmala was an infrastructure initiative project first proposed back in 2003 by Atal Bihari Vajpayee for the development of ports and harbors of India. The project will completely focused over the modernization of port for global standard to increase the trades with foreign nations. The project suggested updating 12 trading ports and 1208 fishing ports. Though the project had been proposed by the Vajpayee government in 2003 the Indian Ministry of Shipping had passed the project from its table only on March 2015. 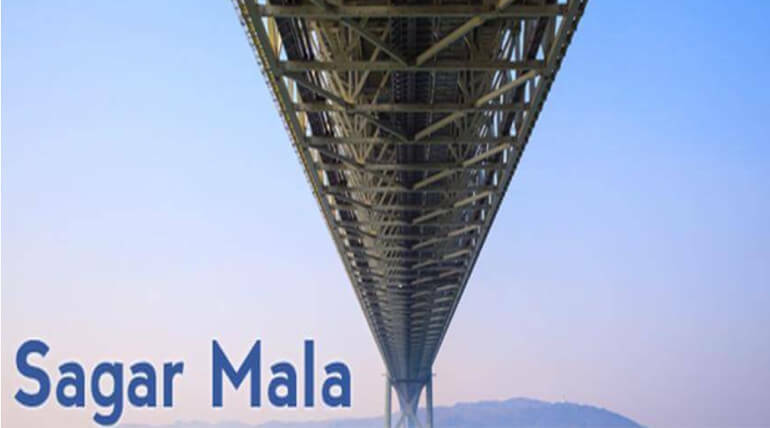 After the project passed the table the central government had created the Sagarmala Development company in July 6, 2016 with an joint investment of 1000 crore but the total investment of the union government in this project is only 90 crores. The Sagarmala project will impose competitiveness over India with the world. The project directly helps in the development of urban and rural transport system and efficiency of the trading. The trading of the produced goods through road will cost more expenses and time consumption, but the Sagarmala project boost up the inland and outland trading via sea. From 2015, the Modi government had planned to invest Rs. 8 lakh crore in the project which specifically involves in economical development but the project boost up the wealth of some ultra rich corporate companies indirectly. The project entitles its policies of interconnecting the railway tracks, upgrading ports, building new ports, laying pipelines, transporting gases and petchems through pipelines directly to their destination, creating road networks, etc.. The policies of the government will definitely lift up the income of the corporate companies like BHEL, Pennar Industries, Adani Ports, L&T, JSW, TATA steel, Oil India, Oil country, etc., either directly or indirectly. The government coins the reason for the project is to create employment around 40 lakhs jobs and the investment of 4-8 Lakh crores per year to increase the export and import with less time consumption. The project which entitles the development of trade and economical status will severely affect the livelihood of fishermen community and strong environmental infections. The plan is to upgrade the ports and built new ports but the upgrading and porting will cost the survival of fishermen and will create a vulnerable coastal environment. The transport of the petrochemicals through pipe line will not support the green environment and dangerous to the agriculture lands where the pipes would be laid to decrease the distance. Hence the agriculture fields which are considered as the backbone of India will loss its food production. The gas pipe line which laid under the agriculture land will cause destruction, damage and infertility due to some leakage. The project will helps in the complete raise of corporate and industrial development where the country is mainly depends on agriculture. These lead to the storage of economical wealth in a one particular place which literally means the inflation. The development of equal economy will be totally buried in this case. The privatization of ports will provide the extreme power over the private organizations, which is completely against the democracy.